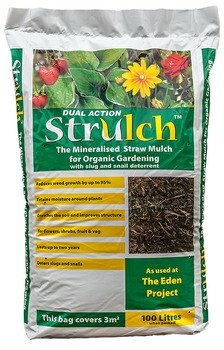 Strulch is manufactured in Britain, entirely from locally sourced quality wheat straw with added iron minerals. The patented process stabilises and colours the straw producing and easy-to-use garden mulch. For use on borders, raised beds, around cultivated fruit and on vegetable plots. Leave on beds for more than one year or work into the soil at the end of the season to improve soil structure and drainage. Please note that Strulch darkens with age when spread or in the bags to produce an earthy brown colour.